Never before have populist parties had as strong support throughout Europe as they do today. On average a fifth of all European voters now vote for a left-wing or right-wing populist party. Timbro’s ”Authoritarian Populism Index” has been created to shed further light on populism. Never before have populist parties had as strong support throughout Europe as they do today. On average a fifth of all European voters now vote for a left-wing or right-wing populist party. The voter demand for populism has increased steadily since the millennium shift all across Europe. No single country is clearly going against the stream. 2015 was the most successful year so far for populist parties and consistent polls show that right-wing populist parties have grown significantly as a result of the 2015 refugee crisis. So far this year left-wing or right-wing populist parties have been successful in parliamentary elections in Slovakia, Ireland, Serbia, and Cyprus, in a presidential election in Austria and in regional elections in Germany. A growing number of populist parties are also succeeding in translating voter demand into political influence. Today, populist parties are represented in the governments of nine European countries and act as parliamentary support in another two. Hence, one third of the governments of Europe are constituted by or dependent on populist parties. It is of course impossible to know whether we are in the beginning, the end or in the middle of this exceptional wave of success for populist parties. What we can say is that, taken together, this wave constitutes the biggest change in the European political landscape at least since the fall of the Berlin Wall. For the West European party systems it is the biggest change since the breakthrough of democracy. It is hard to overestimate the significance of this challenge for the political elites. This development is by no means unknown. The breakthrough of the populist parties among voters has been accompanied by extensive coverage in both media and academia. The emergence of these parties has been carefully plotted by both academics and journalists. In Sweden, more than 20 books have been published about the Sweden Democrats in a seven year period, while other parties have only generated a handful collectively. Populist parties are covered systematically by journalists and European media outlets report almost daily on populist successes with the result that Marine Le Pen, Geert Wilders and Viktor Orbán are among the most well know politicians of our time. Stretching back at least fifteen years there is also a large body of academic writing on the populist parties, many times larger than the literature on any other group of parties. This has significantly increased our knowledge about the rise of populism and the demography of its voters. We now have a relatively clear picture of who votes for these parties and why. Firstly, despite the bulk of academic and journalistic output on populist parties and politicians, the overall picture is still not clear. We have a great deal of knowledge about the particulars, but the larger picture remains fuzzy. How strong will the current populism be in the long run? Discussions on populism are often strikingly provincial, not least in Sweden, where attempts to explain the rise of the Sweden Democrats rarely go beyond national factors. How representative is the success of right-wing populist parties in Scandinavia and Eastern Europe of Europe as a whole? Due to the current media logic the success of populist parties is reported to a much greater extent than their defeats, which brings an obvious risk of a distorted overall picture. The first aim of this report is thus to give a general overview of how strong populism is in Europe today in the light of a longer time frame. Secondly, discussions on populism too often focus only on right-wing populism. Practically everything written on populism, at least outside Southern Europe, is almost entirely concerned with right-wing populism. Within the political sciences the study of right-wing populist parties has even become its own field of study, while studies on left-wing populism are rare. To a certain extent, this order is justified since it is the right-wing populism that has grown most notably, particularly in Scandinavia and Northern Europe. However, in Southern Europe the situation is the opposite. If the goal is to safeguard the core values and institutions of liberal democracy we need a parallel focus on those who challenge it, regardless of whether they come from the right or the left. It is seriously worrying that seven per cent of the population in Greece vote for a Nazi party, but it is also worrying that five per cent vote for a Stalinist one. The second aim of this report is therefore to present an overview of the threat of populism, both right-wing and left-wing, against liberal democracy. Thirdly, media reporting, but also the academic literature, suffers from great difficulties in differentiating between anti-democratic and anti-liberal parties. This can lead to both under and overestimation of the threat against democracy. When the growing populism is erroneously described as the return of fascism or as the rise of extremism it is an exaggeration of the threat. Voter support for anti-democratic parties is actually significantly lower than what the current media reporting suggests; in total, roughly two out of a hundred European voters vote for a party with an anti-democratic ideology. On the other hand, accounts that only focus on the populist aspects of these parties tend to underestimate the authoritarian elements that constitute the backbone of the ideology and practice of these parties. Populism is not in itself a threat to democracy; on the contrary, a certain degree of populism can have a positive effect or even be viewed as an essential party of democratic politics. It is rather the authoritarian strain in these parties that is dangerous and threatens the values and principles that have been at the core of European democracy for more than half a century. The third aim of this report is therefore to contribute to a broader discussion on the ways in which populism is a threat to liberal democracy. The term authoritarian populism is therefore used as an umbrella term for the parties examined here. In the next section the term authoritarian populism is discussed. This is followed by a section describing the method used to create the index. The remaining sections present the rise of populism in terms of election results, parliamentary mandates and political influence. The report ends with a concluding section, discussing the implications of the results. Ever since the first decades after the Second World War, European politics has contained a broad political centre. There has been an unusual consensus among social democrats, liberals, Christian democrats and conservatives in Scandinavia and Northeast Europe concerning the fundamental aspects of representative democracy. A basic respect for the dictates of majority rule has been combined with a gradual expansion of individual rights, enshrined in constitutional law and international conventions, out of reach for any temporary parliamentary majority. There is a solid consensus regarding the importance of independent courts, independent media and the protection of minorities’ rights against oppression from the majority. The green parties joined this consensus during the 1980s, as did most of the post communist socialist parties after 1990. Therefore, when political power has shifted it has rarely had any impact on the forms of politics, but only on its contents. These ideals have also come to constitute the foundation for the joint European institutions – The EU and the Council of Europe – and have guided new democracies as they have joined the European project, at first in Southern Europe and later in Central and Eastern Europe. To a large extent the European identity and self image revolve around these particular liberal democratic values and institutions. The consensus, however, does not stop there. Over time a consensus regarding important parts of the political content has also developed. Since decades, almost all established parties in Europe are supporters of the European Union. Likewise, a considerable majority of them have a largely positive attitude towards globalization. The struggle between the Right and the Left regarding the size of the public sector is today largely played out within the boundaries of a liberal paradigm, in which any serious threats against private ownership have been removed. Nor are there many established parties that question the foundations for the existence of a welfare state. There is undoubtedly difference in opinion on immigration, but also a relatively firm consensus on the importance of secular and universal legislation. Defence, energy, education, and environmental politics – there is a long list of areas where the parties occupy different positions on a scale, but where the extreme positions are rarely present. This report aims to give a comprehensive overview of the parties that turn against the whole or parts of this European consensus. Why the term authoritarian populism? The term populism is arguably among the more elusive in the social sciences. It is commonly used both to describe a certain political style and a political ideology. In the former sense all parties contain populism to varying degrees – political messages, even opinions, are adapted to what one assumes voters want to hear; the complex is simplified, conflicts of aims hidden. In this respect, populism is a matter of degree, parties and politicians acting more or less populist. However, not all parties have embraced a worldview that pits the elite against the people, which is at the core of most definitions that focus on populism as an ideology. In this regard, the differences between populist and non-populist parties are of a qualitative kind. Takis S Pappas (2016) has suggested that contemporary populism should simply be defined as democratic non-liberalism. This definition highlights two things: that populism is democratic while at the same time non-liberal. It is a view of democracy that recognizes the right of the majority to decide, but which rejects the liberal limitations of political power. This opens up the possibility to view populism, as Cas Mudde (2007) has formulated it, as the answer to non-democratic liberalism. That is, in its best moments populism can serve as a corrective against a political elite that does not respect the rules of democracy. The reasoning of Pappas and Mudde makes up the basis for the definition of populism in this report. The term authoritarian populism is used to highlight the authoritarian, non-liberal aspects of these parties’ ideologies and practices. Authoritarian populism is used in this report as a collective term for the parties that turn against the whole or parts of this European consensus. To a great extent this is paralleled with two existing families of parties; firstly, the right-wing populist (aka ‘the radical right’) and secondly, the left-wing populist. But it also includes parties that reject the foundations of liberal democracy on ideological grounds: a few remaining totalitarian parties on the left (Trotskyists, Maoists, Leninists), a few right-wing totalitarian parties (fascists, neo-Nazis) as well as handful parties that argue for a considerable curtailing of liberal democracy on religious (essentially evangelical) grounds. The ambition is thus that the category be all-encompassing and include all parties critical of this European consensus, regardless of whether they are populist or not. This also means that a few parties, which lack authoritarian elements –for example anti-corruption parties in post-communist Europe – have been excluded. In practice, however, there is considerable overlap between the populist and authoritarian categories: almost all successful populist parties are authoritarian and almost all successful authoritarian parties are populist. In the category of right-wing populism alone the differences are substantial, which can be seen among other things in the repeated difficulty in creating joint groups of parties in the European Parliament to the right of the European People’s Party. This is partly due to personal disagreements, but primarily it reflects significant differences in ideology and policy. The category includes parties with roots in both Nazism and liberalism. It includes parties with both radical nationalistic ideologies and parties that are more populist than ideologically driven. It includes openly racist parties and parties that sometimes use xenophobic rhetoric. Simultaneously, the left-wing includes parties with roots in both Marxism-Leninism and in peace movements, parties with both radical socialist ideologies and parties that are only vaguely ideologically driven.It should be stressed that the category ”authoritarian populism” contains parties that vary greatly from one another. ”Authoritarian populism” does not therefore constitute a family of parties and in the selection of parties there is no ambition to ascribe bigger similarities to them than necessary. The ideological differences are often huge, not only between but also within these categories, and in many cases the parties included here are strong opponents. For a number of these parties totalitarian is therefore a better description than authoritarian. It’s an important qualitative difference between parties that explicitly reject democracy as a form of governance and parties that, within the boundaries of democracy, stretch its limits. Therefore, a distinction is made in the index between totalitarian and authoritarian parties. The former are those that espouse non-democratic ideologies. However, notwithstanding these variations, a number of significant similarities remain, which motivate a summary of authoritarian and totalitarian left-wing and right-wing populist parties. Firstly, the self image of these parties is that they represent the people against the elite. This is a corner stone in all populism. These are parties that present themselves as the representatives of the people in an irreconcilable conflict with a corrupt elite. Margaret Canovan (1999) notes that populist movements both on the right and left take for granted that there is ”a people” excluded from power ”by corrupt politicians and an unrepresentative elite”. “asserts that there exists a fundamental divide between the political establishment and the people”. One immediate consequence of claiming to represent “the people” rather than ideas or interests is that the conflicts of aims are completely erased from the worldview of these parties. For example, Umberto Bossi, the former leader of Lega Nord, described his party as ”libertarian, but also socialist”. Norbert Hofer of FPÖ, who was only a few votes away from being elected the president of Austria in May 2016, describes his party as a ”centre-right party with a high degree of social responsibility”. The Sweden Democracts, along with many other anti-immigration parties, refuse to situate themselves on the left-right scale. One natural consequence of the populists’ mistrust of the political elites’ ability to represent the people is the demand for direct democracy. They are eager proponents of referendums on EU, on immigration, on the rights of minorities, etc, a logical consequence following the view on democracy in which the majority is always right. For example both the Dansk Folkeparti and the Norwegian Progress Party want to make it possible for citizens to demand a binding vote ion practically any issue. Secondly, authoritarian populism is marked by a lack in patience with the rule of law. Anton Pelinka (2013, pp. 3) has defined populism as ”a general protest against the checks and balances introduced to prevent ’the people’s’ direct rule” and the political scientist Tjitske Akkerman (2005) has stated that the populist parties are “activists with respect to the law”. Populists therefore wish to remove any impediments to political decision-making. Minorities should have no right to slow down new laws supported by a temporary majority. The collective – the people – should trump the individual. Thus, when authoritarian populists have been in government they have often found themselves in conflicts with constitutional courts. At the beginning of the 2000s, FPÖ pushed through laws with such speed that many of them could be annulled afterwards by the Supreme Court on purely procedural grounds. In Hungary and Poland, populist governments have begun, at a very high pace, to change or attempt to change the rules. Among those actions that have been most strongly criticized from the international community is the limitations that the parties want to impose on the role of the constitutional courts. In this respect there is considerable overlap between right-wing populism and nationalistic ideas. The nation is the people, the majority should have the power and the existence of minorities is a potential threat to the populist view on democracy. As the political scientist Cas Mudde (2007) has pointed out: “all Populist radical right parties are nationalist, but not all nationalist parties are radical right populist”. The current left-wing populism, on the other hand, represents something new, compared to the traditional left, which used clearly demarcated categories like ”class” and ”worker”, in other words, segments of the population thought to be in a constant conflict of interest with other parts of the population (class against class, workers against capitalists). “The people” of contemporary left-wing populism, however, is all-inclusive in a way that has more similarities with right-wing populism than with the traditional left (Zaslove, 2008). A third similarity is the pursuit of a more powerful state. In an election manifesto Jobbik writes that they strive for ”a potent, active and capable state” (Lerulf, 2012, pp. 29), which can be said to be representative of practically all the parties included here. The state should do more, it is the state that should solve the problems and the state is the natural instrument for bringing about societal change. There are naturally both similarities and differences when it comes to the view of how this power should be exercised. Practically all the parties included in the index are highly eurosceptical. Almost all of these parties are also critical of NATO. On the other hand, they often have a positive view on Russia under Putin. They are all critical of globalization and free trade. Voter patterns in the European parliament serve as a short introduction to how often the left-wing and right-wing radical parties find common ground on certain issues, despite significant ideological differences. The right-wing populists generally wish to empower the police and military. Left-wing populists on the other hand (but also many right-wing populist parties, like Fidesz and Front National) have an authoritarian view of the market and want to nationalise banks and big corporations. Right-wing populists usually, but not always, have a traditional view on family, nation and religion, whereas left-wing populists in many countries instead advocate increased rights for homosexuals and ethnic minorities. The latter, however, is also true for right-wing populists in for instance the Netherlands. For the fourth, there are also conspicuous similarities when it comes to style and use of language. Revolutionary language is often used. These are parties that promise dramatic changes fast. This is in stark contrast to the modesty that has characterised the political establishment in Europe. When Geert Wilders and Marie Le Pen held a joint press conference before the European parliament election in the autumn of 2013, they vowed to fight the ”monster in Brussels”. Beppe Grillo compared his movement to the French Revolution, “but without the guillotine”. The fifth and last reason to consider left-wing and right-wing populists together is the significant overlap between their voter bases (Oesch 2008). There are major demographic similarities between the Scandinavian voters voting for right-wing populist parties and the Southern European voters who vote for left-wing populist parties. From a European perspective they complement each other: The success of left-wing populists in South Europe comes at the expense of right-wing populism. The starting year for the study is 1980. It was during the 1980s and 1990s that the majority of today’s populist parties emerged. A comparison stretching further back in time would have been interesting but is not necessary to shed light on the transformation that has taken place. The study includes all EU member countries, as well as Iceland, Norway, Switzerland, Serbia and Montenegro, i.e. all European countries with consolidated democratic systems. The criterion for inclusion is that the country is considered ”free” by Freedom House. Therefore, Serbia is included from the year 2000 and Croatia from the year 2001. The purpose of including all democracies is to give, as far as possible, a comprehensive overview of authoritarian populism in European politics. The reason for excluding all non-democratic countries is that the comparison is rendered pointless if it includes countries that systematically limit the democratic rights of its citizens. Even in the semi-authoritarian states that hold regular and fairly free elections (Macedonia, Albania, Bosnia-Hercegovina, Moldova) the range of alternatives to authoritarian populism is far too limited for any meaningful comparison. The study includes the results for all the parties in all elections to national parliaments. European parliamentary elections or regional and local parliaments have not been included. This would obviously have been a valuable complement, but a more comprehensive study has not been possible at this stage. The selection of parties is no exact science. It entails qualitative assessments of moving targets. Also, the labelling of the parties often differs greatly from the self image of its representatives; there are almost no parties that would define themselves as populists. Very few parties flaunt their authoritarianism. Given the amount of material it would not be possible for an in-depth analysis of each party. I make no claim to originality in my categorisations, however. On the contrary, the ambition has been to use, as far as it has seemed reasonable to me, the most common categorisations of parties. The aim has been for the categorisation to mirror the ideology of the parties. Therefore, I have made use of a long list of sources: academic literature on European party systems, populist parties and single parties, the ideological labels given on www.partiesandelections.eu and Wikipedia, and the expert survey Chapel Hill Expert Survey (CHES), a quantitative summary of the parties’ positions on a left-right scale, along with several other dimensions useful in catching right-wing populists (but not left-wing populists), for example the view on minority rights, immigration and multiculturalism. In practice, however, the classification is generally easier than it may appear. Despite disagreement as to labels there is largely consensus on which parties can be grouped together. In difficult cases I have tried to judge the core of the party’s ideology, and for this I have consulted primary materials such as party programs as well as secondary literature on the parties. It should be emphasized that authoritarian populism is not the only characteristic for the included parties. On the contrary, it is common that populist parties also contain values of freedom alongside the authoritarian ones. This is true for both right-wing and left-wing populist parties. For instance, several right-wing populist parties – such as the Norwegian Progress Party – espouse a market ¬liberal view on economic questions, even though, as Cas Mudde (2007) has pointed out, it is commonly thought that neo-liberalism would be especially important to right-wing populism. In a similar way, many left-wing populist parties have a liberal view on social issues, or, alternatively, collaborate with non-authoritarian socialist parties or green parties. Reversely, there are of course authoritarian elements even in established parties. The defining factor for the study is therefore not the existence of authoritarian populism in the party but how prominent it is. A further difficulty comes from the fact that many parties are in movement. In particular, many of the parties described as right-wing extremist during the last decade have moved away from extremism. The extent to which they’ve succeeded is point of constant disagreement between independent observers. Front National is a clear example of this, as is Sverigedemokraterna. FPÖ is included in the study from 1986 onwards, when Jörg Haider became party leader and anti-immigration became an integral part of the party. Fidesz is included from the year 2002, when the formerly liberal party veered over to the populist side. To measure the demand for authoritarian populism, election results have been used. In total 206 parties that have got a minimum of 0.1 per cent in an election in any of the 33 countries since 1980 have been included. For each country the total share of votes for authoritarian/populist parties is stated. To make the change from year to year easy to grasp, a European average based on the latest election in each country is given. The German 2013 election is therefore the basis of the German average for 2014 and 2015. Thus, the index answers the question how many people, at the end of each year, voted for an authoritarian populist party the last time they had a chance to vote. To measure influence two indicators are used. Firstly, the total amount of mandates. The index shows how many mandates are held each year by representatives of authoritarian parties. This measure naturally only includes those parties that managed to secure mandates. Parties like Front National or the United Kingdom Independence Party have been relatively successful when it comes to numbers of votes, but as a result of the French and British election systems they have not been able to convert this into anything other than limited parliamentary presence. The second indicator is participation in a government. In addition to measuring election results and number of mandates (114 of the parties have won mandates at some point) I have classified the parties as ”left-wing” and ”right-wing” and as ”authoritarian” or ”totalitarian”. Right-Left is primarily dependent on the parties’ own classification. In doubtful cases I have followed the most commonly used designations used in the secondary literature and in a few, particularly difficult cases, I have used the parties’ choice of collaborators to decide. These cases, however, are so few that a potential error in classification is of no real significance for the main results. The division into authoritarian and totalitarian depends on the parties’ view on democracy. Only explicitly anti-democratic parties have been classified as anti-democratic. If a party contains Nazism, fascism, communism, Trotskyism, Maoism etc. it is a totalitarian party. During the period between the two world wars, authoritarian parties were highly successful in the fragile European democracies. The obvious point of reference is of course Weimar-Germany. In the last free election in November 1932 democratic parties won less than half of the votes: the Nazis got 33 per cent and the communists 17 per cent. This pattern could be seen in large parts of Europe at the time, where both the right and the left split into democratic and anti-democratic factions. In terms of popular legitimacy, both social democrats and conservatives were challenged by anti-democratic alternatives. When the democracies on the continent gradually collapsed this was only in part against the will of the people. The Second World War put an end to this. Since the end of the war democratic parties have won overwhelming majorities in practically all elections. Liberal democracy has become a super-ideology, uniting parties with roots in both socialism, conservatism, and liberalism, Christian democratic parties as well as green parties. The lowest point for the challengers of democracy was reached in 1987, when only 9.5 per cent of European voters voted for a totalitarian or authoritarian left-wing or right-wing alternative. Communist parties reaped some success during the first years after the war. In Czechoslovakia the communists won in a fairly free election in 1946. At the end of the 1940s one fourth of Finnish voters voted for the communist party, in Norway and Belgium about half that number. Even in countries such as Greece, Italy and France there was great support for Moscow-loyal communist parties. However, already during the 1950s support began to dwindle. The strong ties with the Soviet Union were increasingly considered a burden. The parties founded towards the end of the 1960s, which had China as an inspiration and Maoism as ideology attracted many intellectuals, but almost no voters. In total, social democracy came out stronger at the other end of this wave of left-wing radicalism; in Sweden the Social Democrats won over 50 per cent of the votes in the 1968 general election. At the beginning of the 1980s less than ten per cent voted for left-wing authoritarian parties. By then many of the Western communist parties had moved away from plans of a one party state and centrally planned economy. In Italy the communist party opened up for democracy already in the 1970s and joined a coalition goverment with the Christian democrats. In Sweden the loyalty to the East remained by means of congratulary telegrams and festivities, but in the actual domestic politics the communist party was an integrated and mainly democratic party during the 1980s. When the 1980s became the 1990s both the voters and the parties had left communism behind. Comment: Mean support for left-wing authoritarian and totalitarian parties 1980-2016. The support for left-wing authoritarian parties levelled out during the first half of the 1990s but then continued to drop and reached its lowest point, 3.7 per cent, in 2006. Only in a handful of Southern and Central European countries did the left-wing authoritarian parties attract any significant number of voters. During the last five years, however, the support has almost doubled. The increase is driven mainly by the exceptional successes for left-wing populist parties in Greece, Italy and Spain, but left-wing radicals have also been successful in countries such as Denmark, Belgium, Ireland, Romania and Croatia. The comeback coincides with the aftermath of the financial crisis, but it is not within the scope of this study to discuss causal relations. What do these parties stand for? Some of them are communists by name, define themselves as inspired by Marxism-Leninism in their party programs, and use traditional communist symbols. The Greek communist party KKE has yet to shed its Soviet Union heritage and proudly uses the hammer and the sickle as its party symbol. Syriza contains several highly radical parties, for example the Maoist and revolutionary KOE, which broke loose from KKE in 1956 in reaction to the ”revisionist” de-Stalinization under Khrushchev. The Portuguese communist party PCP still has Leninism as its ideological basis. The French Front de Gauche includes Partis communiste des ouvriers de France, which was founded in 1979 with Albania as the inspiration. These are parties whose democratic credibility is non-existent. However, there are many other parties, that are not especially dogmatic in practice. The Cypriot communist party AKEL’s (”The progressive party of the workers”) pay lip service to Marx, Engels and Lenin but in reality are strikingly pragmatic in their politics and relatively modest in their euroscepticism. The Czech KSCM, the only former Eastern European ruling party apart from the Moldavian communist party that has neither changed its name nor its principles since the fall of the wall, has still made enough of a turn for the Czech social democrats to find it possible to collaborate with them on the local and regional levels. However, it was not long ago that the Czech senate was in favour of banning KSCM on the grounds it had not distanced itself from political violence. The Latvian socialist party, a successor to the communist party in the Soviet Union, is ideologically communist but attract voters mainly by advocating increased political rights for the Russian minority in Latvia. The biggest parties within Syriza and the French Front de Gauche should rather be seen as radical socialists than communists. The French communist party, which was formerly Moscow-loyal, has kept its name but today distances itself from the Soviet Union and has turned on a number of issues. The same is true for the Spanish communist party, a part of Izquierda Unida, which already in the 1970s took steps towards democracy. The Danish Enhedslistan is both democratic and revolutionary according to its party program. Even if many of the parties have an ambivalent relationship to revolution,they are united in a highly radical critique of capitalism and the EU. These are parties that would like to see the EU dissolved and capitalism dismantled, but they are rarely clear on what the alternative should be or how these radical changes should come about. Instead, they often end up in a rather vague and general critique against ”globalisation”, ”the elite” and ”big business”. An interesting pattern, which can be discerned with some distance from 1989, is that the parties in which the traditionalists were the strongest are also the parties that have survived the best. In Portugal the traditionalists held their party in a firm grip and chose to keep Leninism as the their guiding ideology at the 1990 party conference. 25 years later most of their voters remain with them and the pragmatism mainly shows in their ability to enter into civilized coalitions with especially the green party. The French communist party, which celebrated Stalin way into the 1980s, has also kept its voters. In the countries where these parties reformed early they have not done as well. The most successful communist party in Western Europe was, as we have seen, in Italy. On average, every fourth, sometimes every third, voter voted for the communist party, which during big parts of the post-war era was Italy’s leading oppositional party, more successful than the socialist party in influencing the trade union movement. Already in the 1970s steps were taken towards independence from Moscow and towards merging communist visions with parliamentary democracy. Through assurances to voters that the multi-party parliamentary system would remain through severe criticism of left-wing terrorism and with parliamentary support for financial cuts, the communists were considered presentable enough to collaborate with the Christian democrats in a ”national government of solidarity” in 1976. This was followed by a backlash and by the end of the 1980s the party contained widely differing wings, but the traditionalist remained the minority. When the party changed name and ideology and transformed into what is today Italy’s leading social democratic party, the radical wing broke loose. Today, after decades of divisions, secessions and mergers only a few per cent of voters remain willing to vote for a radical left-wing party – this in a country where the voters had such faith in the communist ideals for such a long time. Instead, it is the populism of Beppo Grillo – difficult to place on a left-right scale, although definitely more to the right – which attracts those voters. The development of the Italian left-wing is thus illustrative of the pattern of transition within the radical left across Europe: from anti-democratic dogmatism to authoritarian populism. Fascist parties were highly discredited after the Second World War and with a few exceptions they have continued a dwindling existence in the fringes of parliamentarism. But the distaste for authoritarian politics went deep and hindered the emergence of populism. When Ernest Gellner and Ghita Ionescu observed the world in 1969, in one of the first scientific studies on contemporary populism, they saw that it was on the rise everywhere, except in democratic Western Europe. The success in the 1970s of right-wing parties of discontent in countries such as Denmark and Norway had only a marginal effect on the overall picture: right-wing authoritarian politics had been defeated once and for all in 1945. At the beginning of the 1980s, right-wing authoritarian parties were thus a marginal phenomenon. Only one European voter in a hundred voted for a fascist or right-wing populist party. But since the second half of the 1980s the support has increased steadily. Today the average support for right-wing authoritarian parties is slightly more than twelve per cent. On two occasions – in the middle of the 1990s and in the beginning of the 2010s – there have been signs of stagnation, but in a longer perspective, the support continues to rise. Comment: Mean support for right-wing authoritarian and totalitarian parties 1980-2016. The rise of the right-wing authoritarian parties is well known and frequently reported. During the first half of the 1980s these parties only got a few scattered votes here and there. The first real breakthrough came in 1986, when Front National won 9.9 per cent of the votes in the French parliamentary election. In the same year Jörg Haider assumed leadership of the Freedom Party of Austria (FPÖ) which as a result became critical of immigration and secured 16.6 per cent of the votes in the 1990 parliamentary election. With the democratization in Eastern Europe came a number of successes for radical nationalist parties: The Czech Republic, Slovakia, Slovenia and Romania were among the countries that had right wing extremists in their parliaments early on with voter support between five and ten per cent. At the same time Vlaams Blok had its breakthrough in Belgium (6.6 per cent in the 1991 election) and the right-wing populist party Ny Demokrati entered the Swedish parliament. While many of the Eastern European parties regressed or in some cases died out entirely, the majority of the parties in Western Europe have remained. Even though there is disagreement as to labels and demarcations between them there is no doubt that there is a family of right-wing populist parties today and that it is doing well. Even countries long thought to be particularly difficult cases for right-wing authoritarian parties – Sweden, Germany, Great Britain – have witnessed their rise to prominence in the 2010s. As we have already seen, the right-wing authoritarian parties are made up of a plethora of ideologies, opinions and attitudes. The overall picture, just as with the left-wing authoritarian parties, is that if you want voters in the 2000s you need populism, whereas parties with a totalitarian message have stagnated or become completely marginalized. Anti-immigration views and euroscepticism are the two main issues driving the rise of right-wing authoritarian parties. Brussels symbolizes an elite which has distanced itself from the people and which is forcing immigration policies on the member states against their will. The free movement is connected to migration of low qualified workers. If one looks to the successful parties, labels such as fascism are generally misleading, but in some cases they are relevant: Golden Dawn in Greece, Ataka in Bulgaria and possibly Jobbik in Hungary. These parties can be viewed as the parliamentary branch of movements that also includes vigilantes. They want to exclude minorities on ethnic and religious grounds, advocate an extremely radical nationalism and do not hesitate to use violence as a political tool. The development of left-wing and right-wing authoritarian parties’ make it clear that since the period between the two world wars European voters have never been as eager to support authoritarian parties as they are today. During the 1980s every tenth voter on average voted for an authoritarian party. During the 1990s the support increased somewhat and stabilized at around eleven per cent, where it remained until the beginning of the 2000s. When the financial crisis of 2008 hit Europe voter support for authoritarian parties had climbed to 13 per cent. Since then the increase has accelerated. In Europe as a whole authoritarian parties won 18.7 per cent of the votes in the last elections. The increase between 2014 and 2015 was the single biggest yearly increase. Comment: Mean support for all authoritarian and totalitarian parties 1980-2016. Over time this is a highly dramatic development. The wave of authoritarian populism is a pan-European phenomenon. There are practically no safe harbours anymore. Only three countries – Malta, Montenegro and Iceland – lack voter support for authoritarian parties. In Luxembourg and Slovenia the support is very weak. It is worth noting that it is five of Europe’s smallest countries that lack authoritarian parties. One consequence is that in terms of numbers of voters in Europe the support for authoritarian populism is underestimated in this comparison since it is the election results of the parties in each country that are compared, regardless of the number of voters in the country. 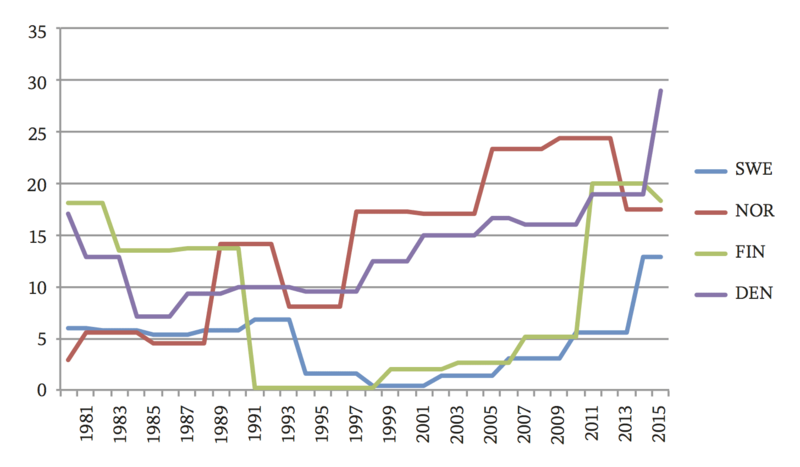 Comment: Mean share of four authoritarian and totalitarian parties in the last election. At the other end of the spectrum three countries stand out, countries whose political landscape is now completely dominated by authoritarian populism: Hungary, Greece and Poland. In all three of these countries the traditional left has collapsed; in the latest election in Poland the social democrats even lost their place in parliament, so far a unique occurrence in European politics. In Greece it was the left-wing populists who could capitalize on the corrupt social democrats, while in Hungary and Poland it is the right wing populists who have won through their combination of nationalism and welfare populism. 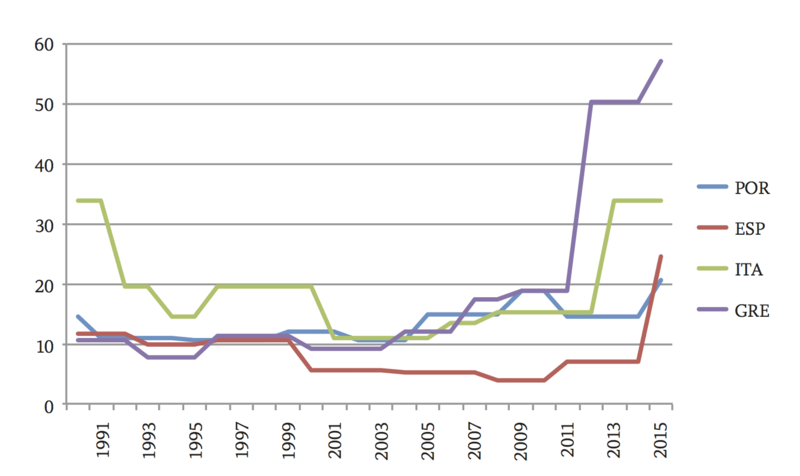 Comment: Share of support for authoritarian and totalitarian parties in elections in Greece, Hungary and Poland. Switzerland and Austria are among the countries in which right-wing authoritarian parties established themselves the earliest. The FPÖ formed a coalition government with the conservative Österreische Volkspartei after the 1999 election and SVP has been a part of the federal Swiss government for decades. In the short term, government participation had a negative effect on the voter support for FPÖ but the party recovered fairly quickly. In opinion polls FPÖ has been the biggest party for quite some time. Germany was long considered immune to populism but in the 1990s both the right-wing extreme Republicans and the former communists, who later became Die Linke, managed to attract voters through the scepticism of reunification. 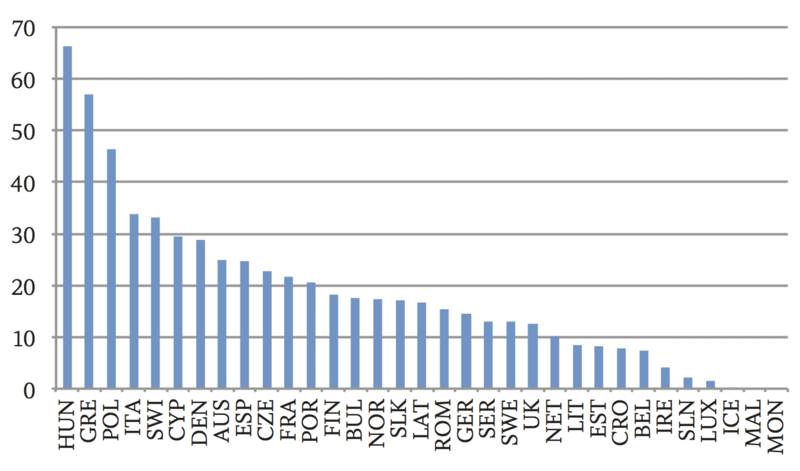 In the 2010s the EU sceptical ARD has reaped success in all of the elections in which they been represented. The Nordic countries were long considered a fruitful case for comparative studies, by political scientists seeking to explain variation. Right-wing populists were highly successful in Norway and Denmark but failed in Finland and Sweden. In the 2010s, however, Scandinavia has come to represent the showcase of right-wing populism in Europe: the Progress party and the True Finns party are represented in governments since 2013 and 2015 respectively, Dansk folkeparti act as parliamentary support for a conservative government since 2015 and, after the election in 2014, the Sweden Democrats has played a huge role in Swedish politics. With the exception of Finland, where the government participation has caused a loss of voter support, the parties are today clearly above their latest election results. Comment: Share of support for authoritarian and totalitarian parties in elections in Denmark, Finland, Norway and Sweden. Likewise, Southern Europe has shown great intraregional variation. During the 1980s Italy was the odd one out, with strong communist and pro-fascist parties. In the 1990s, through Lega Nord, Italy was the only country in the region in which right-wing populism had any success. During the 2010s, however, authoritarianism has been on the rise in all of Southern Europe. In particular, the success of left-wing populists is driving this development. Comment: Share of support for authoritarian and totalitarian parties in elections in Greece, Italy, Portugal and Spain. In the 33 countries included in this study there is a total of 7843 mandates in the national parliaments. Parties that have been classified as authoritarian hold 1342 of these, while totalitarian parties hold 147. That equals 17.1 per cent and 1.9 per cent respectively. Consequently, representatives of illiberal and/or antidemocratic parties hold almost a fifth of the mandates in European parliaments. 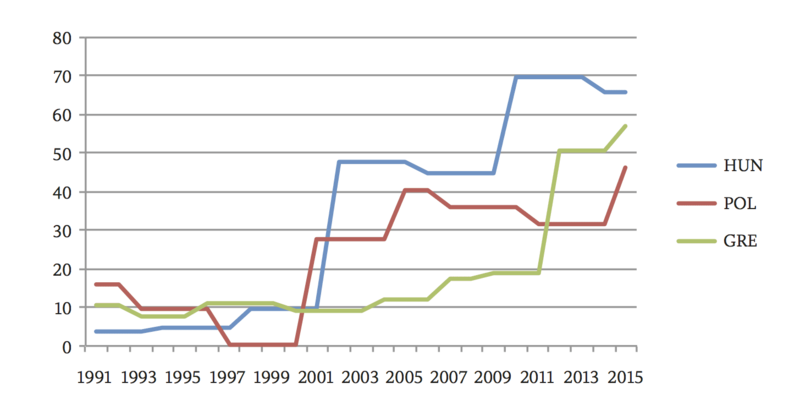 Comment: Total number of MP:s in elected parliaments for authoritarian and totalitarian parties. The authoritarian parties, as we have seen, do not constitute a single group of parties. Often, however, they are united in their citique of the European consensus on both the basic framework of politics as well as some of its contents. In this perspective it is worth noting what a large share these parties constitute. As a comparison, social democratic parties have about 27 per cent of the mandates in European parliaments. With a broad definition of liberal parties (including everything from social liberals to conservative liberals) these parties have less than 600 mandates collectively, i.e. less than eight per cent. By their sheer presence these 1489 parliamentary representatives from authoritarian and totalitarian parties exercise political power. By voting they have an impact on the resulting decisions and they have a platform from which they influence opinion. For some of them that is it. Most totalitarian and several authoritarian parties remain isolated in the parliaments; other parties refuse to collaborate with them; informal systems are developed to curtail their influence. However, the majority of the authoritarian parties function as regular parliamentary party groups. They negotiate with other parties and form more or less long-lived and deep coalitions. A dozen of them are either in government or very close to being in power. At the time of writing, authoritarian parties participate in governments in nine European countries: Hungary, Poland, Greece, Norway, Finland, Latvia, Lithuania, Slovakia and Switzerland. In Denmark and Bulgaria they act as support to the ruling parties. What used to be rare has thus become commonplace. In the 1980s, authoritarian parties were only rarely part of governments. In 2016 authoritarian populists are in a position of government in a third of the democracies in Europe. This is an extraordinary change in a very short time period. There is therefore a lack of systematic studies on how these parties use their power and what the long-term consequences are. So far, the research has mainly regarded election results, party cohesion, polarization etc (Ackerman & de Lange 2012, Loxbo 2010). Comment: Number of countries with an authoritarian or totalitarian party in government. Experience from the countries in which authoritarian parties can form a government on their own shows that they will not hesitate to use their power. As soon as they gain power, as Cas Mudde writes, the right-wing populist parties apply the ideal of ”an extreme form of majoritarian democracy, in which minority rights can exist only as long as they have majority support” (Mudde 2007, pp. 156). This became obvious in Hungary when Fidesz returned to power after winning the 2010 parliamentary election. The same happened in Poland after Law and Justice returned to power in 2015. In Greece too the government has used its power to sway the media in an attempt to diminish the opposition.2 In Italy Lega Nord succeeded in pushing immigration policies in a more restrictive direction already in the 1990s. The same is true for the Danish People’s Party in the beginning of the 2000s (Akkerman 2012; Bulli & Tranconi 2012). In a similar fashion authoritarian parties have quickly begun to change cultural policies. Front National has never had any power on the national level but in 1995 they won power in three communes. The party viewed these as showcases: they focused on crime, cultural policies and grants to societies and associations. Royalist, nationalist and Catholic societies saw an increase in their grants, whereas grants to societies fighting poverty, racism or AIDS were cut (Veugelers 2012). The parties’ presence also has an indirect effect. There are studies showing that populist parties have an effect on established parties, making them adapt to a welfare chauvinistic message (Schumacher & Kersbergen 2016). The overarching question is of course how the authoritarian populism should be dealt with. We are well aware of its existence and its rise, have more or less well founded theories on its causes, but are still in the dark when it comes to viable counter strategies. Debates on counter strategies are strongly politicised and are generally weakly founded in research. None of this is particularly surprising. The research provides little guidance for the simple reason that there are more studies on the rise of populism than on its demise. As there are many cases of its rise on which theories can be tested but few cases to study for those interested in its demise. There is quite simply a lack of variation in outcomes for a valuable evaluation of which strategies have been successful. Nor should the politicisation surprise us. There is no politically neutral position from which populism can be studied. Analyses and explanations are de facto shaped by ideological starting points. Firstly, it should be noted that almost everyone studying populist parties empirically have a negative attitude towards these parties. Few make any real effort to hide their antipathy. As opposed to other groups of parties, the authoritarian parties do not represent themselves in academia. Secondly, it is clear that analyses of populism and the choice of strategies differ depending on whether they are formulated from a left-wing or a right-wing perspective. The former often leads to economic explanations – inequality as the problem and redistributive policies as the solution. The latter tend to emphasize socio-cultural explanations. Both approaches accordingly portray populism as a symptom, the causes of which can be cured. It is beyond the reach of this study to evaluate the causes of the growth of populism, but in the light of its strength, persistence and proliferation, perhaps a reasonable hypothesis is that populism is now a permanent part of the European political landscape. What then remains is the questions how established parties should deal with the populists. The two most common approaches could be summarized as isolation and competition. On the one hand there are those who stress the importance of, if not isolating, then at least treating the populist parties differently from other parties. Legitimization – in politics and in the media – is considered an important factor behind their success, which can only be fought by excluding these parties. Collaboration should be avoided and debates should focus on values rather than on opinions. Voters should be discouraged and thereby swayed to vote for other parties. Opposed to this isolation strategy are those who consider the rise of populism to be due to lack of competition. Established parties should compete, if not with the same answers, then at least with different answers to the same questions as these parties raise. As long as they are the only ones giving a voice to the populist voters view on the EU, immigration and globalization, the populist parties will continue to grow. Both these perspectives have some merit. Legitimization and a lack of competition regarding specific issues are likely important explanations of the rise of populism. 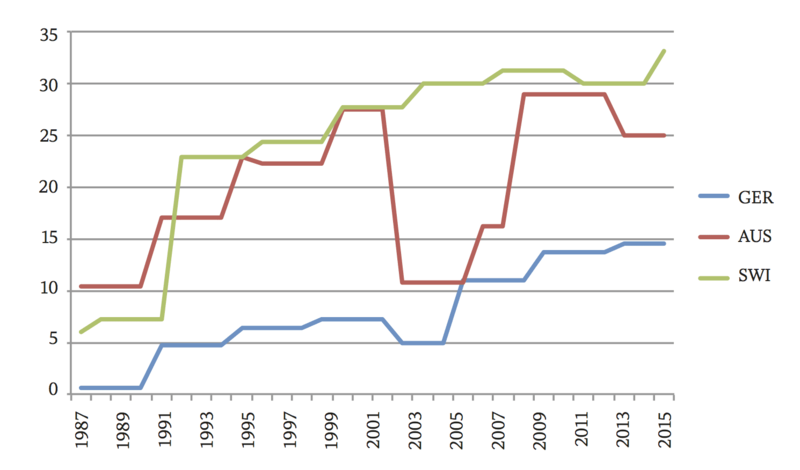 In favourable conditions the isolation strategy can be effective – the cordon sanitaire in Belgium against Vlaams Blok is one possible example – and likewise, greater competition regarding specific issues can hinder their growth: The decrease in voter support for the Sweden Democrats in the polls during 2016 is most likely an example of this. However, both perspectives underestimate the power of populism. As is clear from the survey in this report, support for authoritarian populism has been on the rise for a long time: in times of economic crises and in times of growth, under various institutional forms and with different strategies in politics and media on how to deal with it. Right-wing populist parties were a fringe phenomenon thirty years ago; today they are thriving in Europe. This change has not taken place over night, but is the result of a long and steady rise. Growth of this magnitude cannot be explained by any single factor. Increasing legitimization and lack of competition are part explanations at best for what is really a massive shift in the European party systems. It is not likely that these parties can be pushed back to the margins through isolation or increased competition. What has happened during the previous decades is actually a considerable change in the challenge of populism. It can best be described as a shift from extremism to populism. It is abundantly clear that voters demand authoritarian, not totalitarian, messages. Few of the parties today advocate anything that comes even close to the atrocities committed by fascists and Stalinists during the 1930s, 1940s and 1950s. What we are witnessing is not the return of fascism; those models of explanation lack empirical evidence and are probably counterproductive. As Cas Mudde (2010) has pointed out, the wave of right-wing populism has often been viewed through an erroneous frame of interpretation. The parties have been incorrectly presented as essentially different from the mainstream: “alien to western democracies” whose support can be explained by ”’structurally determined pathologies’, which are triggered by ’extreme conditions’”. Populist radical right ideas are not alien to the mainstream ideologies of western democracy and populist radical right attitudes are not just shared by a tiny minority of the European population. In fact, the populist radical right is better perceived as a pathological normalcy. This does not mean that the populists are mainstream. They still pose a serious threat to the European consensus described earlier in this report, but on essential points they portray themselves, and are considered by voters, as highly compatible with the shared European values. This reasoning has far reaching consequences for the remaining strategies for the parties that have carried this European consensus on their shoulders since the Second World War. With the democratization of the radical left and the breaking of the bonds to the Soviet Union, the need to monitor the line between democratic and revolutionary socialism, for decades aptly handled by the social democratic parties, disappeared. Today, this line has been pushed further left and become difficult to reach, since it now cuts straight through many of the socialist parties; through the broad left-wing coalitions in Greece, Spain and France, through the diverse left-wing group of parties in the European Parliament and through Belgian, Swedish and German left-wing parties. Thereby the responsibility for keeping the left democratic has been shifted from the social democrats to the post-communists themselves. There is a similar situation to the right. The distances between the parliamentary right-wing and the neo-fascist movements used to be huge. But as the latter have shed their old skin, and as new parties have emerged that combine liberalism with authoritarian politics, it is no longer as clear where the traditional right ends and the right-wing populism begins. The line of decency is no longer drawn between established and populist parties, but straight through the populists. And it is being moved towards the centre. To conclude: populism is not a temporary challenge but a permanent threat. There are no signs that support for populist parties will decrease in the short run. It is not even particularly likely that the rate of increase will go down. The populist parties are here to stay. Whether or not authoritarian ideas will spread too remains an open question. Abedi, Amir (2004), Anti-Political Establishement Parties: A Comparative Analysis. Routledge. Akkerman, Tjitske (2005), “Anti-immigration parties and the defence of liberal values: The exceptional case of the List PimFortuyn”. Journal of Political Ideologies, 10:3. Akkerman, Tjitske (2012), “Comparing radical right parties in government: Immigration and integration politcies in nine countries (1996-2010)”. West European Politics, 35:3. Akkerman, Tjitske & Sarah L de Lange (2012), “Radical right parties in office: Incumbency records and the electoral cost of governing”. Government & Opposition, 47:4. Barr, Robert R (2009), “Populists, outsiders and anti-establishment politics”. Party Politics 15. Bulli, Giorgia & Filippo Tronconi (2012), ”Regionalism, Right-wing extremism, populism. The elusive nature of the Lega Nord” in Mapping the extreme right in contemporary Europe. From Local to Transnational (Mammone, Godin and Jenkins, eds). Routledge, New York. Canovan, Margret (1999), “Trust the people! Populism and the Two Faces of Democracy”. Political Studies 47. Gellner, Ernest & Ghita Ionescu (1969), Populism. It’s Meanings and national characteristics. New York: MacMillan. Goodwin, Matthew (2011), “Right response. Understanding and countering populist extremism in Europe”. Chatham House. Lerulf, Philip & Jan Å Johansson (2012), Extrema Europa. Nationalchauvinismens framväxt i Ungern, Nederländerna och Danmark. Lund: Sekel bokförlag. Mudde, Cas (2007), Populist Radical Right Parties in Europe. Cambridge: Cambridge University Press. Mudde, Cas (2010), The Populist Radical Right: A Pathological Normalcy”. West European Politics 33:6. Oesch, Daniel (2008), ”Explaining workers’ support for right-wing populist parties in Western Europé: Evidence from Austria, Belgium, France, Norway, and Switzerland”. International Political Science Review, 29. Pappas, Takis S (2016), “Modern populism: Research advances, conceptual and methodological pitfall, and the minimum definition”. Oxford Research Encyclop http://politics.oxfordre.com/view/10.1093/acrefore/9780190228637.001.0001/acrefore-9780190228637-e-17?rskey=A55nhK&result=53aedias. Pelinka, Anton (2013), ”Right-wing populism: Concept and typology” in Right-wing populism in Europe. Politics and Discourse (Wodar, KhosraviNik &Mral, eds). London: Bloomsbury. Schumacher, Gijs & Kees van Kersbergen (2014), “Do mainstream parties adapt to the welfare chauvinism of populist parties?”, Party Politics, 22:3. Veugelers, John, 2012, “After colonialism. Local politics and far-right affinities in a city of southern France” in Mapping the extreme right in contemporary Europe. From Local to Transnational (Mammone, Godin and Jenkins, eds). Routledge, New York. Zaslove, Andrej (2008), “Here to stay? Populism as a new party type”. European Review, 16:3.